Key features of this system are a low entry-level price and uncomplicated operation. 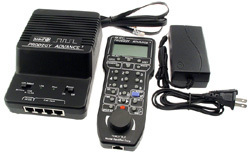 Also, it is very easy to upgrade to the features of any other MRC Prodigy system simply by adding accessories (such as throttles) that have the features you want. For the beginner who needs more sophistication. If you're a multi-user, multi-cab club with a complex layout and you're ready to take advantage of everything the ultimate DCC experience can offer, Prodigy Advance Squared is the system for you. It is also the first DCC system so brilliantly designed that it eliminates the complexities of operation without sacrificing sophisticated technology and comprehensive features. 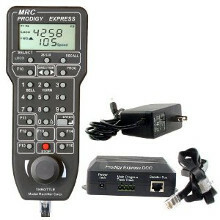 Wireless ready - just "Plug and Play"
Prodigy Wireless is a complete, handheld control system for model railroading that does everything that MRC's Prodigy Advance2 can do... and more... and does it totally wirelessly. 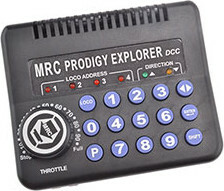 MRC's solid platinum reputation for sophisticated, user friendly DCC technology is evident in the advanced performance of this unique system. Unlike some other systems, Prodigy Wireless lets the hobbyist program, acquire and run all the locomotives and accessories without the chore of plugging in & unplugging. Whenever a locomotive needs to be programmed, our exclusive "Program CV on the Main" button lets you change locomotive characteristics on-the-fly. This lets the model railroader spend less time on a programming track, and more time operating the railroad. With its built-in capability of delivering all 28 NMRA functions, and upgradeable to 100 functions, Prodigy Wireless effortlessly delivers the total control and full mobility and benefits that only MRC's complete, full function, duplex radio control system can deliver. The best range in the industry, up to 80 ft... so there's no need for repeaters. What's more, you can use up to 32 handhelds at one time. Together, these features make this an ideal wireless system for large club layouts. Prodigy Wireless is a stand alone system that comes equipped with a base station, a power supply, a wireless handheld, a recharging cable, and rechargeable batteries.